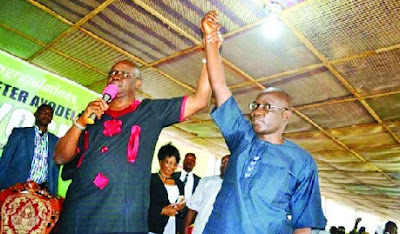 Ekiti State governor Ayo Fayose, at a PDP rally on Monday in Ado Ekiti, declared that God directed him to support his Deputy, Kolapo Olusola-Eleka, to succeed him. “Olusola never said he wanted to be deputy governor, but God instructed me to pick him. I said we will go together after our tenure, but God said I should allow him to stay; that what I said was my own opinion,” Fayose told the huge crowd. The News Agency of Nigeria (NAN) reports that former minister of state for works, Dayo Adeyeye, a serving senator, Mrs. Biodun Olujimi, and Nigeria’s former envoy in Canada, Dare Bejide, had indicated interest in the PDP’s ticket for the July 14 governorship poll. The trio, along with a former Fayose aide and justice commissioner, Owoseeni Ajayi, had jointly rejected the adoption of Olusola as the PDP’s sole candidate and described the step as “pedestrian and undemocratic”. But Fayose, who spoke at the rally held at Okesa area, said that he was not rattled by the negative utterances hurled at him by the anti-Olusola aspirants. “The PDP has taken a position which we think is in the best interest of the state; we shall not be distracted by those opposed to this step,” he said. He expressed confidence that the PDP would win the July 14 election “by God’s grace”.